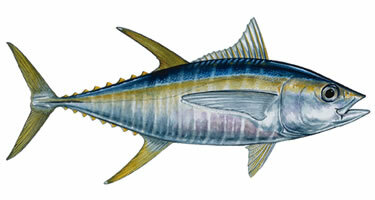 Fish Description: The Yellowfin Tuna is typically dark blue on its back and turns into a gray on the bottom. It's fins and finlets on its back are a tinge yellow. The snout is moderately sharp with a horizontal mouth. The Tunas pectoral fin tip does not extend beyond second dorsal fin's origin. Size: Yellowfin Tuna caught in Costa Rica can be monsters. They can reach 6 feet in length and weigh over 400 lbs. Remarks: Truly a great tasting fish and it is the one most valued in the Tuna family. Often pursued by fleets of purse-seine boats from around the world. Costa Rican anglers just love to catch these true fighters though it can get taxing on the muscles.